Thank you for your interest in donating furniture to help homeless pets. LARGE FURNITURE PICKUPS WILL BE SUSPENDED IN APRIL DUE TO TRAVEL SCHEDULES. PLEASE SUBMIT A FORM IF YOU ARE FLEXIBLE AND WOULD LIKE PICKUP IN MAY. Another Option: We have partnered with a moving company to pick up donations (many of our customers use them when they purchase items from our store). There is a fee involved with their services. The contact information is: Robert Gipson 678-508-5237. Your support is important to us and has helped us provide over $1,000,000 in grants to more than 60 animal rescues. If you are not in any hurry, you are free to fill out the pick-up form. Thank you for understanding. To schedule a pick-up, please scroll all the way down to fill out the form below. 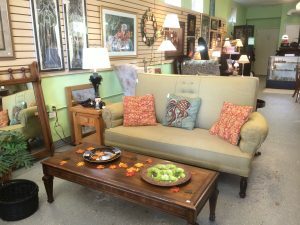 Pickup Radius: We offer pickup of larger furniture items within an 8-mile radius of our stores. As a small organization, our ability to pick up items is based on our current resources, the weather forecast (no rain) and our schedule for a particular week. Pickup Days: We currently offer pickups on Tuesday – Friday between 12-4 pm. We are rarely able to schedule same-day or same-week pickups. Pickup Form: All pick-ups are arranged via the pick-up form below. Once you submit the form, we will try to respond within 2 – 3 business days so we can proceed with scheduling a pick-up. Smaller Donations: At this time, we are not able to pick-up smaller items such as bags of clothing and housewares unless they are part of a pickup of larger items. Questions? If you have questions about donating, you can email us at donations@secondlifeatlanta.org. To schedule a pickup, please use the form to expedite the request. Dropping Off Donations: For information about dropping off donations, visit our How to Donate page. Our driver reserves the right to not pick-up items whose condition is misrepresented. LARGE FURNITURE PICKUPS ARE CURRENTLY ON HOLD FOR APRIL. See top of page for more information. Thanks!